Hot air ballooning is quite a recent adventure activity in India which has commenced just a few years ago, though it has been very popular abroad for several years now. Viewing the world from above, in kind of a free floating basket, makes the activity very exciting and almost fantasy-like. A hot air balloon ride presents a very different view of the same city or town as compared to viewing it from the ground and this has caught the fancy of a lot of tourists in India. However, as still in its nascent stages, this adventure activity is available in only a few destinations in India. A hot air balloon essentially has 3 main parts; an envelope, a burner and a basket. The envelope of the hot air balloon is made up of special material called rip-stop nylon and has specific measurements of width, height, volume and quantity of material. The hot air balloon is then fitted to the basket with steel wire ropes and the lightweight basket itself, is made up of wicker and metal ropes. The burner is positioned above the pilots head and the fuel is carried in a liquid form, under pressure in cylinders and transported to the burners through flexible hoses. An average balloon can stay up for about 2 hours, depending on the wind conditions and speed managed. During flight, the balloon is followed by a chase crew who are in constant touch with the pilot through radio and ensure they are at the landing site, when the balloon comes down. The best time for hot air ballooning in our country, is from October to March, as the cool winter wind is an ideal time for this activity. 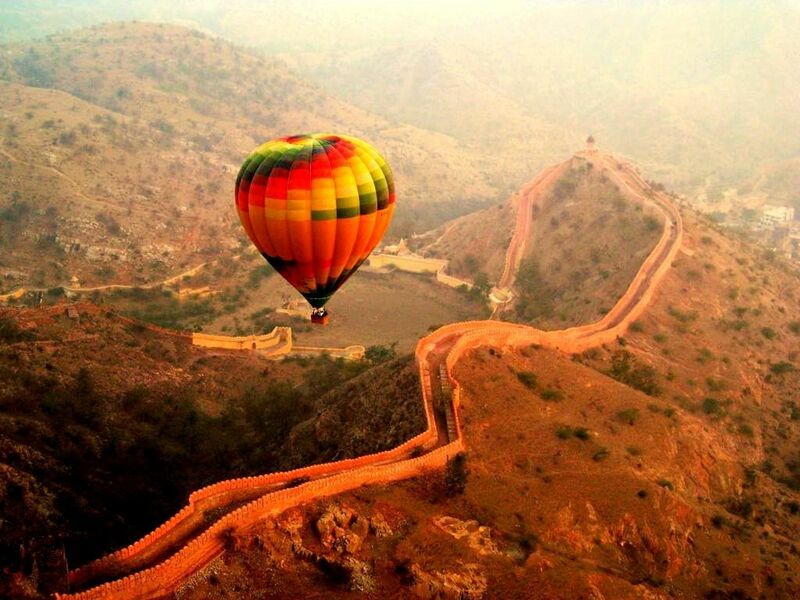 Given below are the destinations where hot air balloon rides are available in India. This desert state is one of the most popular destinations for hot air ballooning. An opportunity to view the spectacular panorama of beautiful palaces and lakes, majestic forts, ancient havelis, various monuments and buildings and wildlife sanctuaries in this state, rich with culture and heritage, is definitely not to be missed. One can undertake this exciting activity in the Pink City of Jaipur, the sandstone city of Jaisalmer, the Blue City of Jodhpur, in romantic Udaipur, in the holy town of Pushkar during the annual camel fair and in the Ranthambore National Park. Kamshet-Lonavla in Maharashtra is another scenic place where hot air ballooning is available. The ride gives you an amazing view of the lush green, misty hills, cascading waterfalls, dams, clear lakes and some ancient forts. This hill station is a quick getaway for residents of Mumbai and Pune, who can enjoy this activity on the weekends. Delhi is all about famous monuments, landmarks, beautiful gardens, Government houses, embassies and other famous sights. Hot air balloon rides take off from the famous Damdama Lake in Gurgaon district, letting you take in the beautiful sights of the Sohna region along with a delightful view of our capital city and from Neemrana, which is on the Delhi-Jaipur highway. An annual Taj Balloon Festival is held in Agra as well in November, which is a dream opportunity for romantic couples as well as those wishing to admire this spellbinding monument from all angles. Goa is most popular and sought after for its numerous beaches, unending coastline, relaxed, fun and party atmosphere with abundant natural beauty. Fast emerging as one of the favourite adventure activities along the shores are the hot air balloon rides. Flying high in the sky over unending seas, long stretches of sand, beautiful green coconut groves and hills along with spectacular views of the sunrise or sunset over the horizon, makes for some unforgettable memories. Hampi in Karnataka is another picturesque locale that offers one the opportunity to enjoy hot air balloon rides. Flying over this terrain along the west coast of India, tourists can get a real feel of this ancient city steeped in history, culture and heritage. The rocky terrain with its interesting rock structures, caves, ancient monuments, ruins of old structures and temples and the remaining existing places of worship provide tourists with a really fascinating view of what this city has to offer. Darjeeling, one of the most beautiful hill stations in West Bengal, has very recently commenced this activity and is a great place for adventure seekers to hop onto a hot air balloon. A ride in these skies lets you feast your eyes on lush, vibrant green rolling hills, undulating tea estates and enchanting flora and fauna. Beautiful vistas of the setting sun are an added bonus as the balloon rides are mostly held in the early evenings. Manali in Himachal Pradesh is well known as a destination for various adventure sports. Hot air balloon rides are another delightful addition to the list in recent years. The experience here is exhilarating as one soars over snow-capped mountains, dense green forests, gushing, transparent rivers, scintillating streams and stretches of beautiful flora. However, the balloons in this destination are tethered or tied down to the ground to maintain the safety and stability of passengers in this cool, crisp air. Bhopal, in Madhya Pradesh, offers tourists the joy of hot air balloon rides. These rides take off from the Jeet Stadium and take approximately two hours to complete. A seasonal adventure activity in this city, the rides are undertaken only when the weather and wind is safe and right. Passengers can admire the dense green forest cover and beautiful lakes in the city.